Set among Switzerland, Varese and the same Lake Lario, the area extending from Como picturesque center reveals a precise and seductive character. 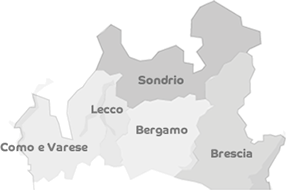 The area belonging to Como and Varese provinces is a mix where history and nature interwine with each other. Through several trails it’s possibile to follow in the footsteps of an ancient balance and connect your own breath to nature’s beat. Like the excursion route through Val Sanagra, Val Cavargna and Val Rezzo (exactly shaltered by the northern banks of Lake Lugano) and Valsolda, offering emotions both to those who walks through it in one go and to people deciding to check out each stop, one after the other, taking a break at the suggestive huts of this varied landscape and of rare beauty. Along northern Lario landscape, history left the footprints to search for and chase, going to a simple excursion the extra mile of a tale, an adventure, a fable that seem to coming from afar, like smugglers’ trai in Val Darengo. Not to mention nature, reigning unchellenged and full of pleasant surprises: the green and wild valleys North of Varese like Val Dumentina and Val Veddasca and moreover the path winding from Lario hills belognong to Como province, through the area of Park Spina Verde, to proceed along the trails of the striking Lura Park: a genuine green corridor born to protect nature biodiversity and restore the increasingly rare and precious relationship linking mankind and nature.